Emmaus, also known as Hammat or Nicopolis, was a large city from the Hellenistic period through the Byzantine period. It is strategically located on the main road from the plains to Jerusalem. Emmaus, also known as Hammat or Nikopolis (Nicopolis), was a large city from the Hellenistic period through the Byzantine period. It is strategically located on the main road from the plains to Jerusalem, and served as an administrative, military and economic center. It is believed to be the site of the village of Emmaus, which is referred in the Gospel of Luke (Chapter 24). This Gospel tells about the meeting between Jesus, after his resurrection, and the two companions, on the road to Emmaus. In 1973 the KKL organized a large park with the financial contribution of Canada's Jewish organizations and named it "Park Canada". It spans an area of 4,500 Dunam (450 Hectares). 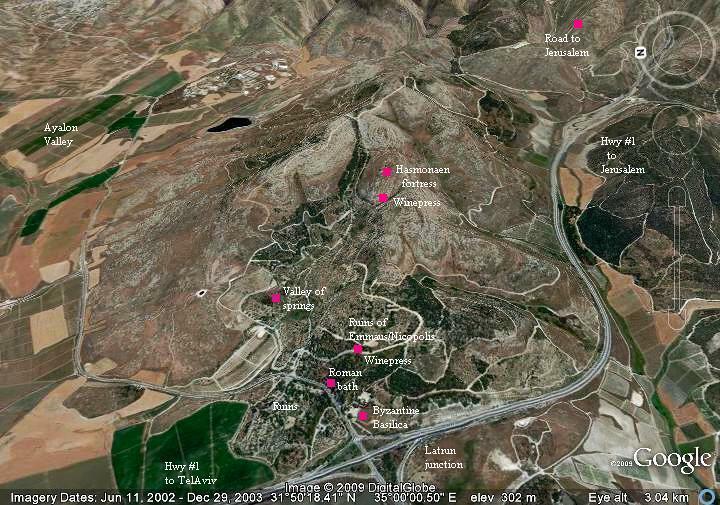 This page is an overview of the sites of Emmaus. Additional web pages detail each one of its sites. The site is located 30KM west of Jerusalem, near the Latrun junction and part of the Ayalon (Canada) park. 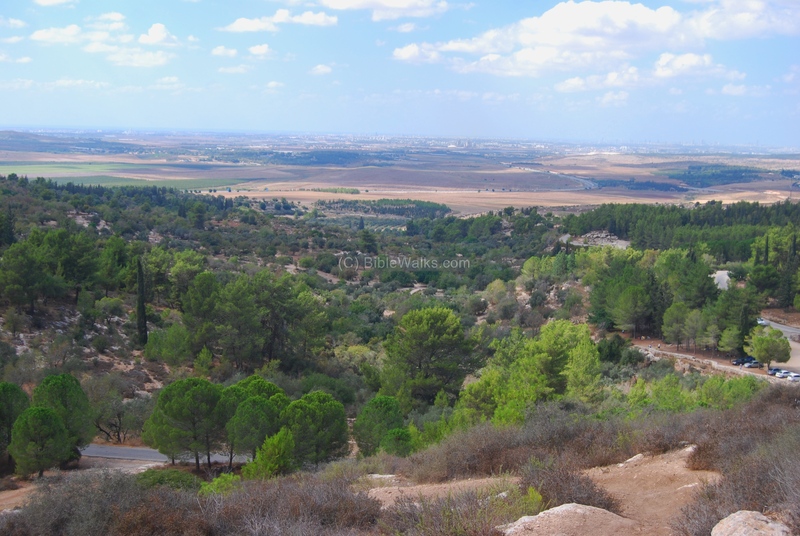 This Region is called the plains of Judea - where the western foothills of the mountainous area of Judea meets the lower section of the valley of Ayalon. The ruins of the old city are scattered over a vast area inside the park and on its west side. An aerial photo of the area is seen below, indicating the major points of interest. You can point & click on the purple points to navigate to the selected point. The Peutinger Map (Tabula Peutingeriana) is a medieval map which was based on a 4th C Roman military road map. The map shows the major roads, with indication of the cities, and geographic highlights (lakes, rivers, mountains, seas). Along the links are stations and distance in Roman miles (about 1.5KM per mile). The roads are shown as brown lines between the cities and stations. In the section shown on the right is the area of Jerusalem, drawn in a rotated direction (Egypt on the left, the Mediterranean sea on the top). Jerusalem is illustrated as a double house icon, which represents a major city. It is listed as "formely called Jerusalem, now called Aelia Capitolina" (antea dicta Hierusalem n(unc) Helya Capitolina). Emmaus is indicated as "Amauante", just above the icon of Jerusalem. It is located on the road from Jerusalem to the cities in the Sharon (Jaffa, Caesarea and Ashkelon). The distance from Jerusalem to Emmaus is indicated as "XVIIII" (19 miles - about 29KM). Emmaus is illustrated as an icon on the 6th Century Madaba mosaic map found in the floor of a Byzantine Church in Jordan. Above the icon is the Greek word "NIKOΠOΛIC" (Nikopolis), the Greek name of the city. The icon shows a walled city with towers and gates, a central basilica and two churches. The site was examined in the PEF survey (1866-1877) by Wilson, Conder and Kitchener. It appears in the center of the section of this map of 1878. The Arab village of Emmaus is named "Aniwas". The Hasmonean fortress in Emmaus is situated on a hill and is called "Kh. el Akid", and its height is 1250ft. An ancient road, marked by a double dashed line, appears to the south of Emmaus, and north of Latrun. This is also the modern route of highway #1 to Jerusalem. A sample of the photos of Emmaus are shown here. For more info and photos, refer to each one of the detailed web pages. The photo below shows a view of the Park, as viewed from the Hasmonean fortress. The valley of springs is located on the right side; the ancient Churches and Roman bath and the ruins of Emmaus/Nicopolis are located on the far left side. The greater area of TelAviv is seen in the background, behind the valley of Ayalon. 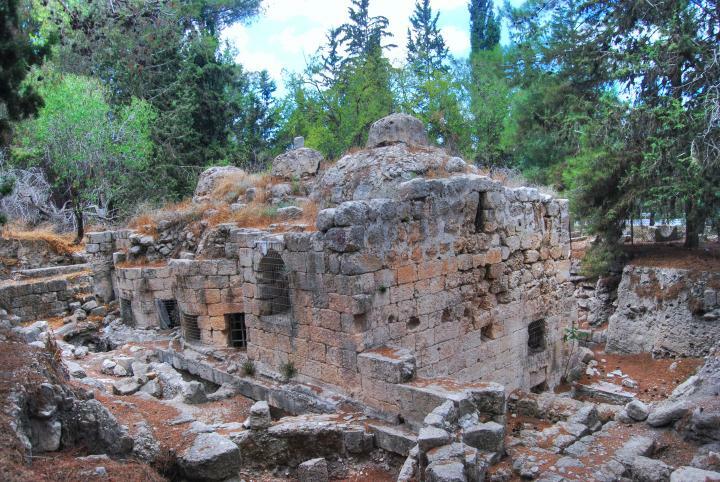 The following photo shows the archaeological site of Emmaus, where the remains of the Crusaders Basilica (12th Century) stands over the 5th Century Byzantine Church. For more information and photos on the churches of Emmaus - click here. Close to the Churches, in the center of an Arabic cemetery, are the excavated remains of a well preserved Roman bath structure. For more information and photos on this structure - click here. 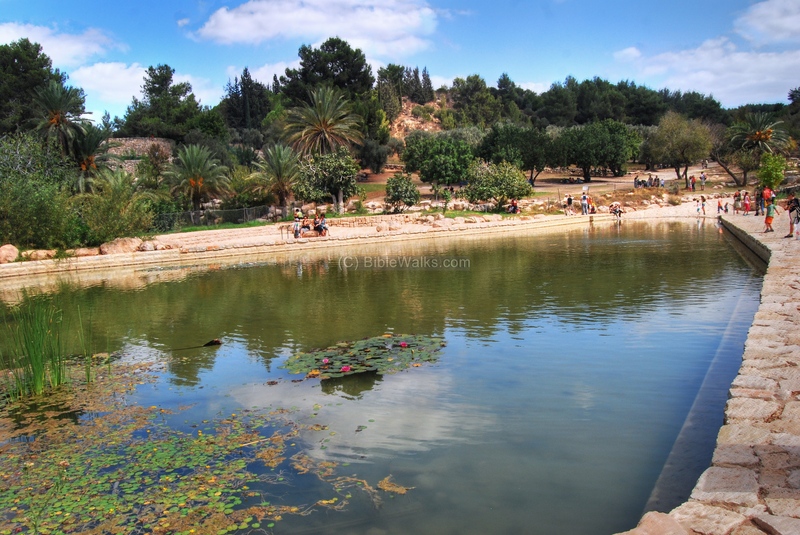 On the east side of Emmaus, now part of Ayalon (Canada) park, is a valley with a number of springs, several sets of aqueducts, cisterns and other installations. It is known as "the valley of springs" and is the park's main tourist attraction. The water supply, built during the Late Roman period, was used as the source of water supply for the ancient city. For more information and photos on the valley - click here. 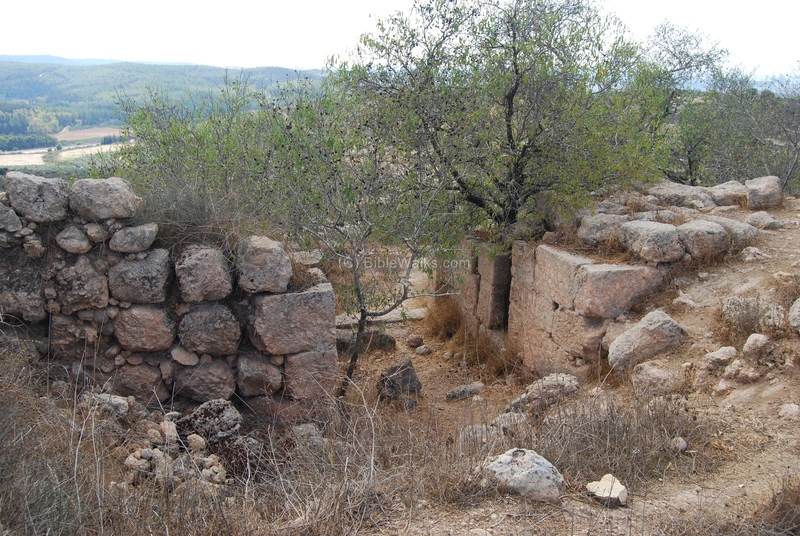 A fortress (Matzad) dated to the Hasmonean period (2nd-1st C BC) is located on a steep hill above the valley of springs. The fortress was constructed by Bacchides, the Seleucid general under Demetrius I Soter, who fought against the Hasmonean kingdom. It was the beginning of the establishment of the city of Emmaus/Nicopolis, which later relocated several KM to the west. For more information and photos on the fortress - click here. Wine production was a popular industry in the Holy Land. 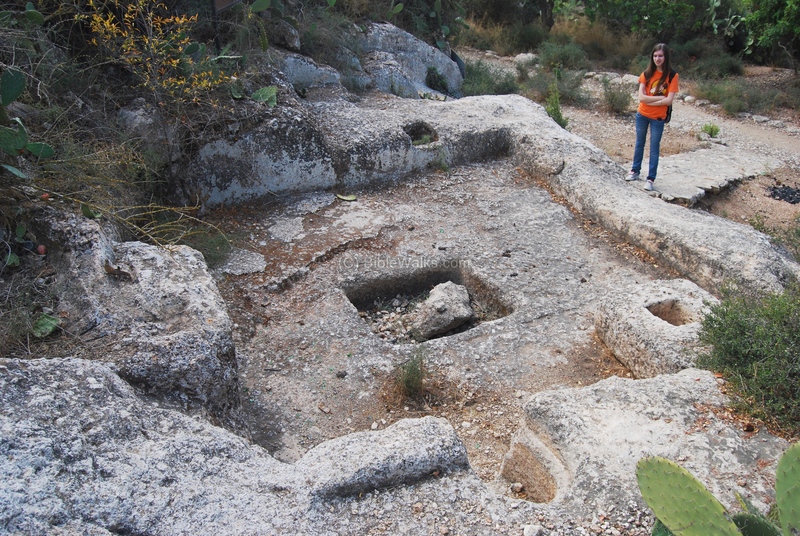 In Emmaus (Nicopolis) there are several ancient installations, dated to the Roman period, cut into the rock. For more information and photos on the wine presses in Emmaus - click here. This text tells about the meeting between Jesus, after his resurrection, and the two companions, on the road to Emmaus. "And, behold, two of them went that same day to a village called Emmaus, which was from Jerusalem about threescore furlongs. And they talked together of all these things which had happened. And it came to pass, that, while they communed together and reasoned, Jesus himself drew near, and went with them. But their eyes were holden that they should not know him. And he said unto them, What manner of communications are these that ye have one to another, as ye walk, and are sad? And the one of them, whose name was Cleopas, answering said unto him, Art thou only a stranger in Jerusalem, and hast not known the things which are come to pass there in these days? And he said unto them, What things? And they said unto him, Concerning Jesus of Nazareth, which was a prophet mighty in deed and word before God and all the people: And how the chief priests and our rulers delivered him to be condemned to death, and have crucified him. But we trusted that it had been he which should have redeemed Israel: and beside all this, to day is the third day since these things were done. Yea, and certain women also of our company made us astonished, which were early at the sepulchre; And when they found not his body, they came, saying, that they had also seen a vision of angels, which said that he was alive. And certain of them which were with us went to the sepulchre, and found it even so as the women had said: but him they saw not. Then he said unto them, O fools, and slow of heart to believe all that the prophets have spoken: Ought not Christ to have suffered these things, and to enter into his glory? And beginning at Moses and all the prophets, he expounded unto them in all the scriptures the things concerning himself. And they drew nigh unto the village, whither they went: and he made as though he would have gone further. But they constrained him, saying, Abide with us: for it is toward evening, and the day is far spent. And he went in to tarry with them. And it came to pass, as he sat at meat with them, he took bread, and blessed it, and brake, and gave to them. And their eyes were opened, and they knew him; and he vanished out of their sight. And they said one to another, Did not our heart burn within us, while he talked with us by the way, and while he opened to us the scriptures? And they rose up the same hour, and returned to Jerusalem, and found the eleven gathered together, and them that were with them, Saying, The Lord is risen indeed, and hath appeared to Simon. And they told what things were done in the way, and how he was known of them in breaking of bread". 3." Upon this Lysias chose Ptolemy, the son of Dorymenes, and Nicanor, and Gorgias, very potent men among the king's friends, and delivered to them forty thousand foot soldiers, and seven thousand horsemen, and sent them against Judea, who came as far as the city Emmaus, and pitched their camp in the plain country....". 4. "And this was the speech which Judas made to encourage them. But when the enemy sent Gorgias, with five thousand foot and one thousand horse, that he might fall upon Judas by night, and had for that purpose certain of the runagate Jews as guides, the son of Mattathias perceived it, and resolved to fall upon those enemies that were in their camp, now their forces were divided. When they had therefore supped in good time, and had left many fires in their camp, he marched all night to those enemies that were at Emmaus. So that when Gorgias found no enemy in their camp, but suspected that they were retired, and had hidden themselves among the mountains, he resolved to go and seek them wheresoever they were. But about break of day Judas appeared to those enemies that were at Emmaus, with only three thousand men, and those ill armed, by reason of their poverty; and when he saw the enemy very well and skillfully fortified in their camp, he encouraged the Jews, and told them that they ought to fight, though it were with their naked bodies, for that God had sometimes of old given such men strength, and that against such as were more in number, and were armed also, out of regard to their great courage. So he commanded the trumpeters to sound for the battle; and by thus falling upon the enemies when they did not expect it, and thereby astonishing and disturbing their minds, he slew many of those that resisted him, and went on pursuing the rest as far as Gadara....for this victory greatly contributed to the recovery of their liberty". "...Bacchides returned presently to the citadel at Jerusalem, having lost about two thousand of his army. He also fortified many cities of Judea, whose walls had been demolished; Jericho, and Emmaus, and Betboron, and Bethel, and Tinma, and Pharatho, and Tecoa, and Gazara, and built towers in every one of these cities, and encompassed them with strong walls, that were very large also, and put garrisons into them, that they might issue out of them, and do mischief to the Jews". Ham - warm in Hebrew. Hammat/Hammath - the Hebrew name of the city, based on its hot springs. Emmaus - the name of the city in Greek, based on the Hebrew name, and means hot springs. Another spa city, called "Emmaus of Galilee" , is located near Tiberias.